Guys, if you are youtuber and people not watch your video and you upset. Please note this guideline carefully. 1):- write about video in 1000 words. For example = Hello friends, welcome my youtube channel and today is video about Samsung mobile. 2):- Paste facebook profile link. 4):- Paste Whatsaap profile id link. 5) Twitter profile id link. 6):- Google plus profile Link. 7):- Youtube channel name link. 9):- if you use without copyright music in youtube video then write. 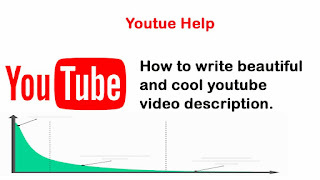 For example:- Thanks For watching my video and please subscribe to my channel for the latest youtube video and press the good icon for notification. LIST OF VISHV TRADING GENERAL KNOWLEDGE BOOKS. 1 Vishv 's 11 Prasidhd Website. 2 Gum huai phon ko kaise khoje.